I have been trying to buy a particular domain name since 2010. I didn’t hear back after my first offer, had my second offer rejected, and my third and fourth offers went unanswered. I followed up in March of 2013, but I didn’t receive a response, and I figured there was no deal to be had. Two days ago, I received a reply to my offer, and the owner provided a reasonable counter offer. I agreed to purchase the domain name, and we had a couple of phone conversations to discuss the transfer of the domain name. Because the owner lives within a couple of hours from me, he asked that we do the deal in person. He has a couple of businesses offline, and although he bought a number of domain names many years ago, he doesn’t have much of an active online presence. I am most likely going to meet this seller in person for a couple of reasons. First, I initiated contact with him, so it’s not like he was targeting me to harm me or steal from me. Second, I don’t want to take a chance that I lose out on this deal since I’ve wanted to buy this domain name for a while. Finally, he is willing to do escrow through his attorney’s firm (a large firm in the state), but I would imagine that could take quite a bit of time since they probably aren’t all that familiar with domain transactions. Listed below are 5 precautions I am going to take when buying the domain name in person. As always, I welcome your advice and feedback. 1) I am going to have him sign a sales contract before the meeting. This will give him and his attorney time to review the agreement and address any issues in the agreement prior to our meeting. 2) We are going to meet in a public venue – perhaps a Starbucks or other restaurant with wifi. Even though I am not too concerned about my safety, it’s a good idea to meet in a public location just in case. 3) I am going to initiate a transfer of the domain name to a registrar that won’t take much time to transfer. Once I pay him, I want to know the transfer is complete. Some registrars release names quickly and others take several days. 4) I am going to pay with a bank check. He will know that he has the money, and I know that if there is a problem, the funds can be tracked. 5) I use two factor authentication at the domain registrar I use, but I will change my passwords after the meeting. I don’t like logging into a publicly used private wifi network, so I will be extra cautious. #5 You can hire me as your bodyguard. You could set up a second account just to receive the name. This would protect all the other names in your main account when using public wifi. Always use an encrypted VPN for public Wifi. Especially in this kind of case. I would change my passwords first at home BEFORE the meeting and then change them again when I return safely home. You can use tether from your phone to get online on your laptop. I am sure it’s not 100% full-proof, but it seems way safer than logging into anything sensitive over public wifi. Or you can buy a little wireless modem thing with prepaid internet access. Buy a dongle and put some credit on it or hook your laptop up to your phone. FYI, #5 link “two factor authentication” is broken. Forgot the http – thank you! I think, there is more to this deal than just exchange of one domain and a check. considering your reputation in domaining he may want to partner with you to sell his other domains. (since you’ve mentioned he has number of other domains) I guess. That was never discussed. He’d be disappointed if that is the case because I don’t broker domain names. It may be ok, but honestly I don’t like this. Also, I was thinking of what Dimester said already – just use a whole new account and don’t bother with any lovely new technology to try to protect your existing account. So back to me not liking this. Just what is his problem with a “normal” deal/transaction anyway? Does he even have a remotely credible reason he gave, and especially one that could not easily be refuted in a convincing and agreeable way? If he’s involving a lawyer, wouldn’t his lawyer be smart enough to understand the normal and customary way this is done all the time from a distance? Don’t accept or fall for any bullspit deviation from the normal types of precautions you’ve already outlined above, no matter how credible and convincing the guys makes it out to be. He sounds like an older gentleman who doesn’t own a cell phone. Doing this deal the old school way is easiest. He offered to use his attorney at a large firm in the state, but that will take extra time, and I doubt his attorney will be all that knowledgable about domain deals. Again, I am the one that initiated this transaction, and I spoke on the phone, so the Whois number is accurate and it’s not like someone stole his email address and was impersonating him or anything like that. Ok, I’ll remain guardedly optimistic then. From your writeup though it’s unclear of the timing as far as you getting control of the domain. He still has to get you the auth code. So let’s assume he has that already (and the name is unlocked). is getting the existing registrar to release the name. to you (to your or anybodies satisfaction). That said I wouldn’t get into contracts. Last time I did one of those might have been 10 years ago. You’re a very high profile, successful and wealthy entrepreneur. Always best to have security close by just in case. 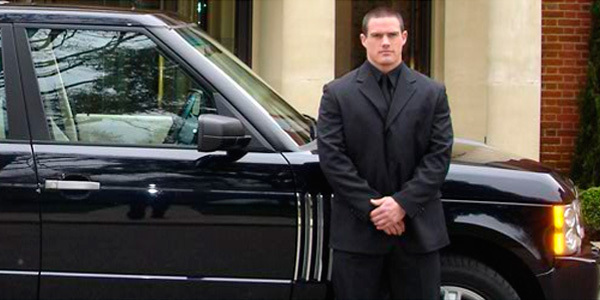 Go with a driver (and get one with a bodyguard look). My advice – take some backup. But seriously, it sounds like this is a legit deal, if he was a scammer and your first contact was in 2010, he wouldn’t have waited 4 years to swindle you. Probably just interested in meeting the person who’s been chasing his domain name. You’re in good company, I think Twitter.com was sold in a cafe somewhere. Update… just got off the phone with the seller, and we are using Escrow.com. He spoke with someone at Escrow.com this afternoon, and he is ready to go. Bummer, would have been interesting to follow this old school transaction through to completion. Hell, might have even been a movie in it, lol. Now it’s via the boring escrow method! Now that’s what I’m talking about. Even if they don’t know anything at all about doing domain deals already, they can be made to see the light with some of that old “instructive nudging” in a pleasant way they can also verify themselves. Plus it doesn’t exactly hurt they can see you’re a known commodity online. I’ve done one deal in person with someone I don’t know… did it at Starbucks and it was pretty quick. You still can cancel a bank check, it’s not true clear funds. He did the smart thing here. Not that you would have. Elliot, have you read the story of Michael Bahlitzanakis in the post dated April 29, 2013 by Domain Gang? You’re acting as if you have Rick Schwartz’s portfolio where you can lose millions of dollars in domain names. It’s good to follow the 5 steps, but is there actually a high 6 figure name to lose? This seller has a business. He seems 100% legit. You expressed interest in this domain name 4 years ago. Now you finally have an opportunity to purchase this domain. Why overthink the deal? I didn’t reveal the price, which isn’t 6 or 7 figures. Desire doesn’t necessarily mean a huge price tag. I am not overthinking anything. I am discussing the precautions I need to take when meeting someone in person to consummate a deal and logging into my domain registrar account from a public wifi network. I think being cautious is a wise move, no? In any case, as I mentioned a couple of hours ago in a comment above, the seller and I spoke on the phone and he agreed to use Escrow.com after speaking with them and speaking with his attorney. Fair enough. Have you ever experienced a deal where the seller took advantage of you? Or are you basing your concerns on those who lost out in previous deals? Usually, a past deal gone wrong would warrant steps to follow. Has this happened to you? I have not. Just being overcautious because it’s a significant amount of money. just curious other names that man bought in his portfolio years ago??? Elliot, I certainly wouldn’t drop any of your precautions but he may just want to do the deal this way because he doesn’t trust or understand online transactions. Especially if he is an older gentleman. I’ve done 3 sales in person and can tell you they were the most enjoyable sales I ever made, one was to a hot female domainer. I bought both a LLL .com and 2 LL .org in person before. Both were fast, easy and enjoyable. Both at an IKEA cafeteria since a half way point for us both. 2 laptops, payment and 20 minutes later a done deal. The biggest thing was getting them to be sure they had their passwords ready (we did a push) and we would have wifi. The other issue was a receipt or bill of sale which again is as simple as a napkin or piece of paper and a sig. My wife had no concern for my safety because I had a friend come along and sit at a nearby table. I can only wish they were all so easy, fee free and that fast. Definitely would better for you to meet in person so you don’t waste money on a domain name such as CloudApp.com in a domain auction. That was a poor flip. Could you share your list of registrars that transfer quickly/slowly? Feel free to email me if you prefer not to post it in public. I’ve had luck with Enom and GoDaddy for speedier transfers. Godaddy, Moniker and Enom all have quick pushes, in fcat nearly instant in some cases. I know GD at the time required the receiver to acknowledge receipt etc but still over all fast. Everything sounds so formal IMO and just remember the more attorneys involved, the more things could go wrong. More eye balls, more confusion. I dont know if its 5k domain name or 50k. Dont care..
Just my 2 cents Elliot. Enjoyed the post. Good luck and I hope it all works out for you. Tell us the domain name too LOL. I bought many of Boulevards’ early names in person. Before escrow and transfer procedures evolved, you had to send a faxed statement and an email to Network Solutions. Seller’s generally demanded cashier’s checks which was risky for buyers. What often happened is that the check was laid on the table and the buyer watched as the seller sent the email. When we bought a dozen big city names (LosAngeles.com, Dallas.com, etc.) in the mid 1990s, I sent an attorney friend, who went to the seller’s house and asked to see the deed to his house and a driver’s license so we’d have some recourse if the names didn’t transfer. The early sellers were a unique bunch, original registrants who had stumbled upon an object of value unintentionally. I met some interesting people and never got mugged.